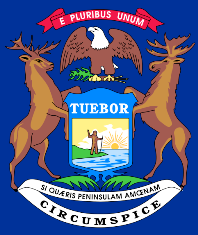 The blue State Flag of Michigan depicts the images of the seal of the state featuring the protective eagle and the shield supported by an elk on the left and a moose on the right. 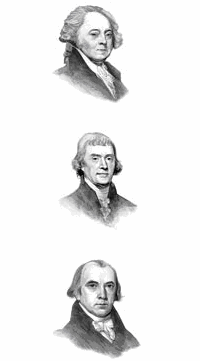 The motto is that of the United States of America. The flag serves as a symbol of honor, heritage and regional pride and is displayed at state buildings. There is a strict Order of Precedence for flags. State Flags are displayed in order as they entered the Union. Car Flags are often displayed to represent of an individual's allegiance to their state. Michigan State car flags are used by their owners as mobile emblems of their home. Car flags are usually made from strong materials and are attached to a car via a pole and clip window attachment. What is the design of the Michigan state flag? The eagle is the emblem of the United States of America and Michigan demonstrates its loyalty by its inclusion on its flag which is further emphasized by the inclusion of the US motto "E pluribus unum" a phrase which means 'Out of many, one'. The eagle was intended to at once to recall the might of the Roman Empire and at the same time be uniquely American (the Bald Eagle being indigenous to North America). The Bald eagle is depicted with its wings "displayed" which is a symbol of protection and in its talons holds three arrows and an olive branch. What do the moose and the elk symbolize? What does the image on the shield symbolize? 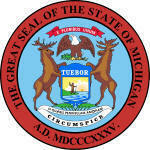 Who designed the Michigan State Seal pictured on the Flag? What is the history of the Michigan State Flag? where equal opportunity and justice to all is our ideal." 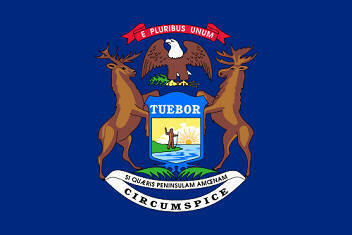 The Michigan flag is kept and used as required by the code specified in the constitution of the state. 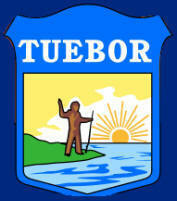 Official Nickname of Michigan "Great Lakes State"